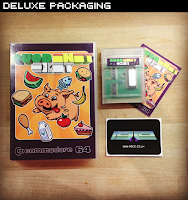 Download Quod Init Exit in .crt cartridge format HERE! Download Quod Init Exit in .prg format HERE! Everybody has their own philosophy of life. Zampo's is: "Whatever goes in, comes out". There's no changing our dear friend's mind. You care about him, and so you tried in all possible ways. "C'mon, don't over do it!" - you told him. And he answered: "No worries: whatever goes in, comes out". Some other time you tried with "You can't think about that - and only that - all the time", yet the reply you got was always the same: "No worries: whatever goes in, comes out". Going for a dramatic "It will kill you!" only succeeded in making the inevitable "No worries: whatever goes in, comes out" resound even more profoundly in your ears. The last time you tried, he stared back at you, spoke those foolish words once again, strengthened the blow with "Remember." and finally added, with all the solemnity of a Roman emperor: "QUOD INIT EXIT". To play the game (downloaded from the links above) you will need either a real C64 (and a method of transferring the files over to it) or an emulator. For emulator users, we recommend VICE, as it works on a variety of systems and is very user friendly. Just download the emulator and drag and drop the .prg file into the open program window (or attach the .crt image from the file menu). The player's goal in Quod Init Exit is simple: help Zampo survive through a full day without dying of hunger or missing the toilet. Zampo is controlled using a joystick plugged into port 2, with left and right for movement and fire for jump. The longer you hold down the fire button, the higher the pig will jump (until maximum pig-leaping height is achieved, of course). Each level starts with Zampo located in the centre of the screen. You'll need to guide Zampo around the colourful screen of platforms in order to catch the yummy food that zips across horizontally, whilst simultaneously avoiding vials of unappetizing poison. The HUD at the bottom of the screen shows the current time of day, points (which continually decrease during play) and your hunger-meter. This meter (represented by five coloured pig snouts) falls constantly, and to win the level you need to max it out by eating as much food as you can swallow. If it falls to two snouts or less, then the music will change to a more frantic melody - and if it depletes entirely you'll starve! Unsurprisingly, as you progress through the game the meter will decrease faster, and will therefore require more food to fill. Poison bottles deplete a snout from the meter, so avoid them! However, this is not all. Stuffing your belly full isn't the key to success. In Zampo's words, "whatever goes in, comes out" - to complete each level you'll also need to catch the toilet and ride it to victory. At the end of the game (met either through completing the full day, dying or simply disgracing yourself by missing the toilet) you'll be awarded a final score based on the current level and points left (as shown in the HUD). Pay attention to what Zampo says when collecting items - he reacts differently to food, poison and when his belly is full. Take note of the level layout, especially when Zampo is almost full. You can only jump upwards and it is easy to get trapped with the toilet below you! Try to make sure you position yourself so that you have a path of descent open to you at all times. Finally, remember this: whatever goes in, comes out! This cartridge version of Quod Init Exit has been in the making for a long time. When the game was originally released, James Monkman and Martin Wendt investigated the possibility of making a 16KB version of the game, but the source code was unavailable and it was simply too big to fit on a small cartridge anyway. A year later, James approached Simone Bevilacqua and Martin again, this time with a 64KB cartridge in mind. Martin wrote a wrapper and cartridge boot code for the game (again without access to the source) learning how the previously undocumented 64KB cartridge hardware worked in the process. Quod Init Exit is based on a very complex joke among Simone and his friends, which the introduction is inspired by. Upon completion, the game was given to the guy who invented "Tutto ciò che entra, esce" (the Italian equivalent of "Quod init, exit", which, in turn, is the Latin for "Whatever goes in, comes out") as a birthday present. Quod Init Exit is copyright Simone Bevilacqua 2009-2012. 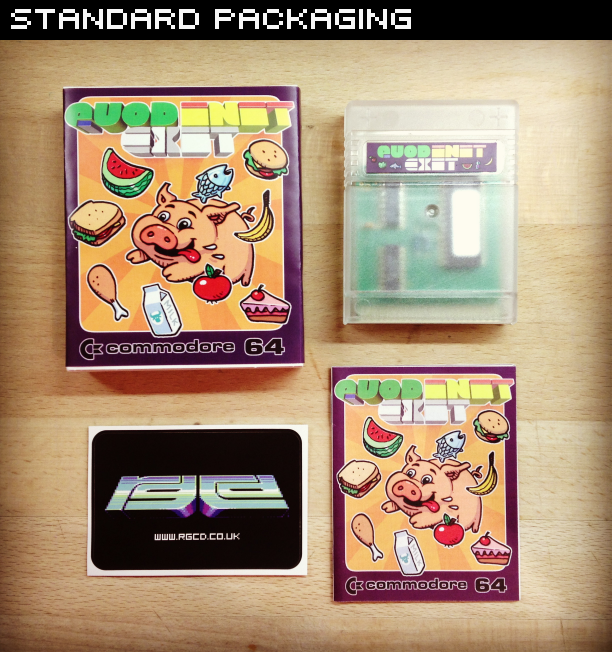 Published on 64KB C64 cartridge by RGCD, 2012. 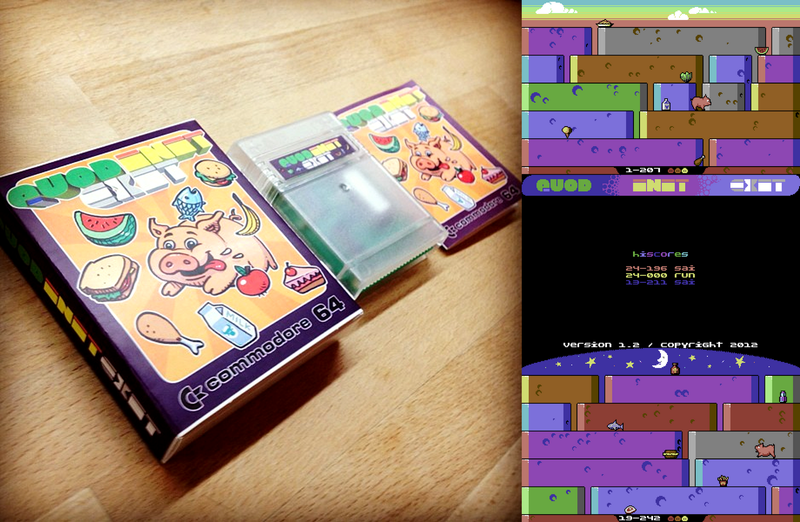 Quod Init Exit has been tested on both PAL and NTSC machines, and works on the C64, C128 and C64GS (there is no keyboard input required to play). Although it runs on NTSC hardware, it does play fractionally faster and will be harder as a direct result of this. As such, the game is labelled as NTSC compatible, but designed for PAL systems. The cartridge version is available to buy from our shop on physical C64 cartridge. 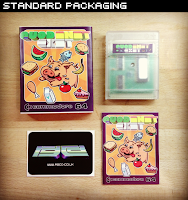 The game is presented in a transparent cartridge shell internally lit by a rainbow coloured LED and comes complete with box designed by Ilija Melentijevic and a printed manual. I found this game fantastic, very playable and BEAUTIFUL !!!!!! !